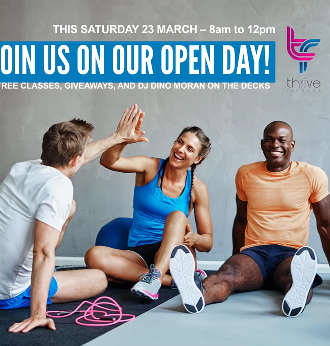 Thrive Fitness opened its doors this month in Hout Bay. Purely local, run by Hout Bay residents for Hout Bay residents. It’s a new concept gym that consists of 4 zones, with 4 stations each working out 4 areas of the body to synchronised music and lighting. This Saturday is their open day – not only free to all but if you attend you get an extra 3 free sessions. Plus giveaways, smoothies and music by DJ Moran. So spend 45 min on yourself this weekend and head on down to 31 Victoria Avenue, Hout Bay.